On a series of pages starting here, I have showed you how to set up a Google Compute Engine virtual machine, run FreeBSD, set up a basic Apache/PHP web server, and then install dual TLS certificates and get an A or better score on the Qualys SSL Labs server analyzer. The last step is to set up some security enhancing HTTP headers. The server can add some headers to its response to tell the browser to behave in certain ways to increase security. I added one header on the previous page, telling the client browser to always set HSTS or HTTP Strict Transport Security. That tells the client that the server is an HSTS server, and throughout the following specified time period the client should insist on only communicating with that server over TLS. The recommended period is one year. Once you accept connections and send this header, you are committed to running TLS for at least the next year. This is why it was important on the previous page to make sure that a regularly scheduled job will automatically renew the certificate through the ACME protocol. It's possible that your site has some pages with sensitive URLs and which contain links to other sites. 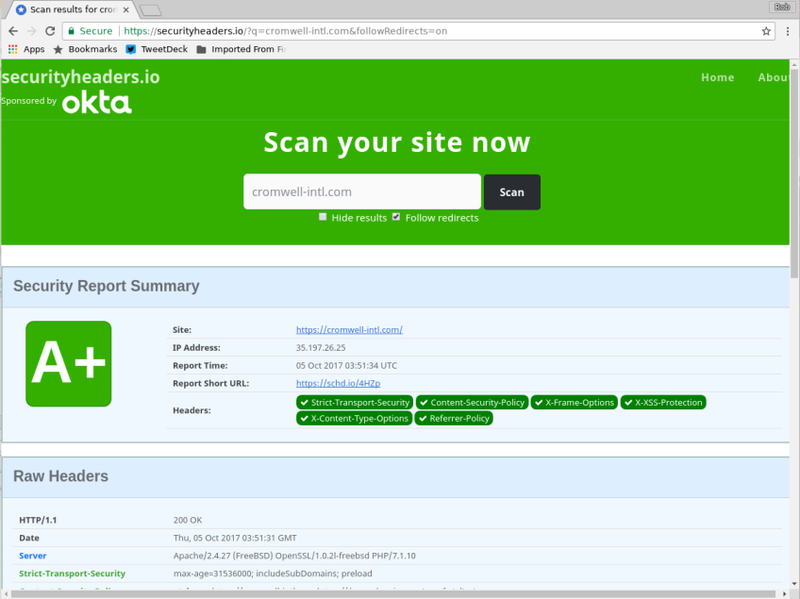 If you need to, you can tell the browser not to report the Referrer data to the server with the linked page. It seems to me that the Referrer data can be helpful when analyzing web traffic, although only a small percentage of clients report it, and even in those cases it may be only partial. For example, maybe the client came to my site from www.google.com, but it doesn't report the entire URL so I don't see the search they did. I leave this almost completely liberalized, telling the browser only to leave it out (if it weren't going to already!) when it's going from an HTTPS URL on my site to a non-HTTPS URL on someone else's. The X-Xss-Protection header tells the client to turn on its defenses against XSS or Cross-Site Scripting attacks. Not all browsers support this, and for those that do, I don't know why they don't always do this by default. Anyway, it's certainly a good thing to tell the browser to protect itself against Cross-Site Scripting. You tell the browser to use one of three modes: "0" to disable the protection, "1" to enable the protection, and "1; mode=block" to enable protection and block the response rather than trying to sanitize the content. The X-Frame-Options header protects against so-called "click-jacking attacks", in which your site's page could be referenced within a frame on a hostile page. This header tells the client that your pages can only be placed within frames which themselves are from your site. The server will report the MIME content-type in the response. The Chrome and Explorer browsers can try to be a little too clever for their own good. They can attempt to read and interpret the content and conclude on their own that it's a different type of data that needs different handling. This can go very wrong if a hostile user can upload content in, for example, a comments feature. All you need to do is tell the browser not to do that. This would be a good time to make sure that you have the correct file name extensions on all your image files. 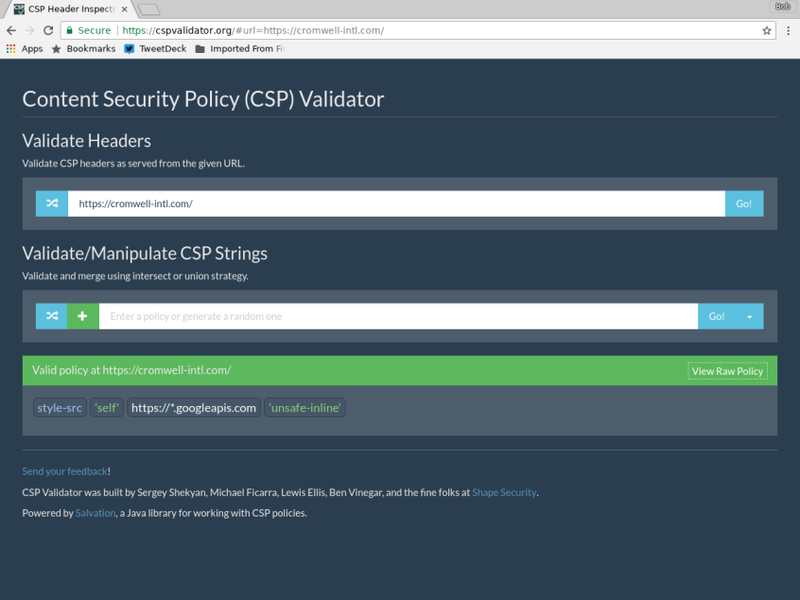 The Content Security Policy header is potentially critical, but it seems to me that its importance depends on what you are doing with your site. It tells the browser to restrict the sources of scripts and style, among other possibilities. For pages with sensitive data, sure, we need to protect against cross-site scripting attacks there. If you allow users to upload data, as with comment fields and similar, it could be a very good idea. However, let's say you have a purely informational site like mine, with no user-submitted content such as comments. Especially if you are trying to support the site with advertising, as I do, this doesn't seem to me to be needed, and it can certainly get in the way. As for the style, the Google Translate widget needs to load a style file from a Google API server. I decided that for my site, restricting the source of just the style was plenty of restriction. It's interesting to see this Google web security page citing the importance of CSP while multiple Google services are incompatible. There are other things you can do. But be careful. HPKP or HTTP Public Key Pinning was all the rage until people started realizing how it could go horribly wrong. See, for example, essays by Ivan Ristic and Scott Helme. As Ivan writes, "The main problem with HPKP, and with pinning in general, is that it can brick web sites." That is, if you lose control of the keys, possibly by accidental deletion, you lose your web site. Even if you suffer no disaster, key rotation becomes an elaborate ritual prone to error. It's hard, and it's dangerous. The following is what I added to httpd.conf. The first one, for HSTS, was already shown on the previous page. # Prevent clickjacking attacks that display pages within frames. # Turn on XSS / Cross-Site Scripting protection in browsers. # "mode=block" = block an attack response, don't try to sanitize the script. # content but use the MIME type reported by the server. # I set Referrer-Policy liberally. 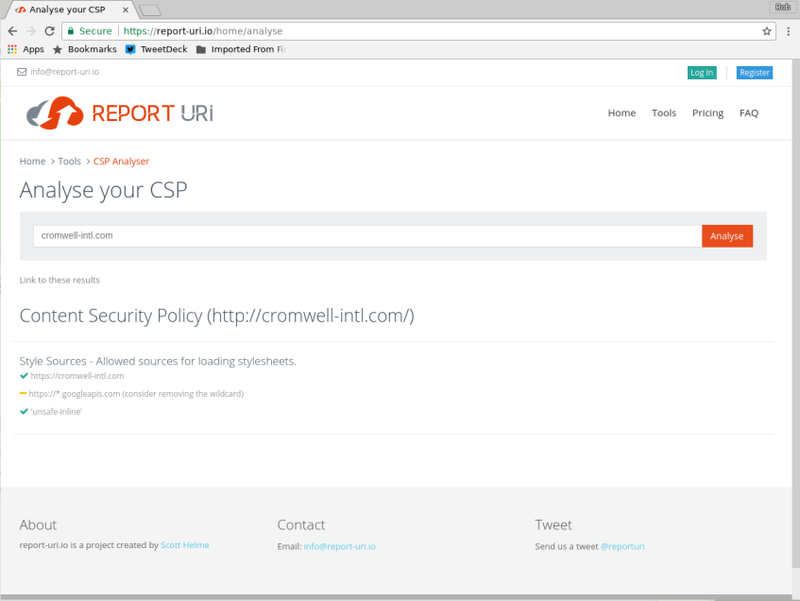 Header always set Referrer-Policy "no-referrer-when-downgrade"
Let's first verify that my CSP can be parsed. Check this at cspvalidator.org. And does it meet approval? Check this at report-uri.io. And how does it score? Check this at securityheaders.io. Once again we see the limitations of automated online validation tools. I had a CSP that restricted the scripts to come from some HTTPS source, and another that attempted to enumerate all the Google and Amazon URLs needed for Google Translate, Google AdSense, Amazon Affiliate ads, and Facebook and Twitter widgets. The second of those broke a few things, but still got no better than an A. If you started in the middle, you might want to go back to the start and catch up on what you missed.